On a daily basis I am involved with people searching our Library for information on clocks, watches and makers. Among the thousands of volumes some of the most heavily used and most helpful books are Tran Duy Ly's series on American clockmaking. 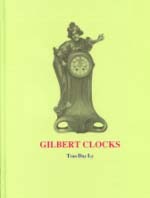 I am excited that yet another of Mr. Ly's books, Gilbert Clocks, has been added to this series and I am confident that it will be a prime source of information on Gilbert clocks for years to come. The book begins with a section, Important Tips, by Mr. Ly on the different factors to consider in identifying clocks. This Important Tips section has been developed and refined by the author over a period of almost 20 years. These thirteen pages could stand alone as an excellent primer for the beginner or the advanced collector on how to avoid the pitfalls of clock collecting. A highlight of many of Mr. Ly's books is the excellent history prepared by the noted horologist, Chris Bailey. Mr. Bailey's history of William L. Gilbert and his many clockmaking firms is superb, taking the reader from the birth of Gilbert in 1806 to the demise of the factory buildings in the 1980's. The bulk of the book is comprised of 29 sections with 1698 illustrations. Porcelain clock collectors will delight in the significant number of pages devoted to these wonderful clocks. These 37 pages comprise one of the largest and best displays of porcelain clocks in any book. Collectors of Ansonia and other porcelain clocks may find imported porcelain cases used by Gilbert that were also used by other firms but which are not shown in the catalogs of these companies. Collectors interested in hanging clocks will find 31 pages of these models. Over 61 pages of wood case mantle clocks will attract those interested in these very collectable clocks. While interest in collecting Miniature grandfather clocks has been increasing, little information has been published on these clocks. Tran Duy Ly's inclusion of these is a first. Novelty clocks produced by Gilbert, of interest to many collectors, are well represented in a 23 page section. Gilbert Clocks is produced to the high standards of the Arlington Book Company and contains 448 pages of information, photographs and illustrations as well as a supplementary price guide. Sonya Spittler's index concludes the book and assures the reader's quick location of a particular clock. The indexes in Ly's books are a feature that greatly enhances their use. The Arlington Book Co. and Tran Duy Ly are to be commended for the excellent books they have written and published. The list of their books on American clock and watch manufacturers now includes Seth Thomas, Waterbury, Ansonia, Welch, New Haven, Ingraham and this book on Gilbert. These books represent over 2,800 pages of facts on American clocks and are a wealth of information for collectors. I am sure Gilbert Clocks, like all of Tran Duy Ly's other books, will be heavily used by collectors. It is a valuable addition to every collector's library.